Discover How to Get Rid of the Pain Safely, Naturally … & Quickly! Do you commonly experience lower back pain and/or pain that radiates down into your leg? If so, you may have Sacroiliac Joint Dysfunction, also known as SI Joint Pain. This condition is common – a recent study called “Sacroiliac Joint Pain: A Comprehensive Review of Epidemiology, Diagnosis and Treatment” found that as many as 15% to 30% of all lower back pain cases are caused by SI Joint Pain. Unfortunately, the condition is also extremely difficult to diagnose. In fact, for decades medical professionals doubted the sacroiliac joint causes any lower back and/or leg pain at all. But now we know better … now we know that if left untreated SI Joint Pain can severely lower your quality of life by causing pain that keeps you from doing the things you love to do. The causes of SI Joint Pain range from gait issues, such as a leg length discrepancy or scoliosis, to pregnancy or recent childbirth, to prior lower back surgery, to engaging in activities that put repeated stress on the joint, such as contact sports, regular heavy lifting or labor-intensive jobs. What I’ve discovered is that the body is truly an amazing creation – capable of healing itself from some of the most horrific injuries and by doing simple exercises, we can actually help our bodies heal even faster. 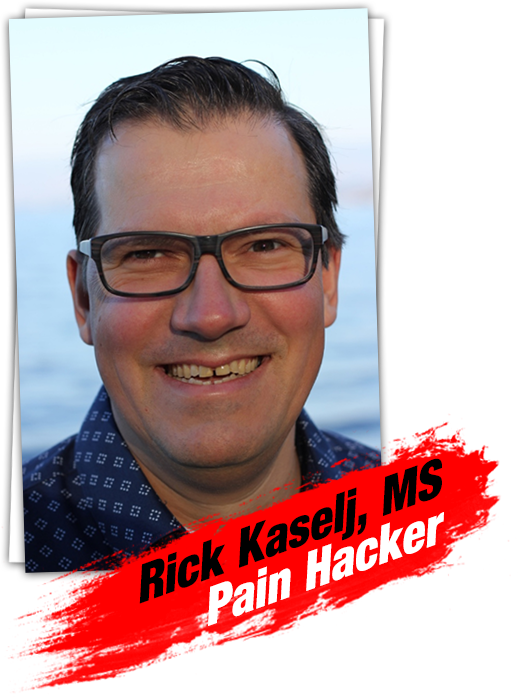 Now I’m going to tell you all about my Sacroiliac (SI) Joint Pain Solution and how it can help you regain pain-free movement without surgery or drugs in just a minute. But first, let me quickly tell you about the sacroiliac joint and why it is important to take action to relieve SI Joint Pain. The sacroiliac joint connects the hip bones (aka the iliac crests) to the sacrum, which is a triangular bone that is located between the lumbar spine and the tailbone (coccyx). The sacroiliac joints are basically shock absorbers that absorb shock between the upper body and the pelvis and legs. Dysfunction in the sacroiliac joints can occur either due to too much movement or not enough movement. If the cause is too much movement, the pelvis will begin to feel unstable and lead to pain that is typically felt in the lower back or hip and may radiate to the groin. If the cause is too little movement, you may feel muscle tension and pain and exhibit limited mobility. The pain is typically felt on one side of the back or buttocks and can radiate down the back of the leg, similar to sciatica pain. If you are experiencing pain related to the sacroiliac joint then I’m sure I don’t have to tell you how disruptive it can be to a normal life. You may not be able to do things that you used to do around the house. You may not be able to play with your kids. You may find it difficult to sleep at night due to the pain you feel. You may have trouble sitting or standing or riding in a car. The pain can wear on you as well and make you feel depressed. You may come to believe that there is no solution to your pain and that you are going to have to live the rest of your life with your symptoms. One of the biggest issues with SI Joint Dysfunction is determining whether you have it or not. Sacroiliac joint pain can be similar to sciatica and other back conditions so it can be hard to decide what you have so that you can treat it the best way. What works for sacroiliac joint pain won’t necessarily work for other back conditions and, in fact, could make them worse. Likewise, treatments for other back conditions could make your sacroiliac joint pain worse. That’s why in my new Sacroiliac (SI) Joint Pain Solution, I’ve included self-assessment tools that you can use to determine if you have SI Joint Pain and how severe your case is. This information will allow you to pursue the best treatment option so that you get results fast. In addition to the assessment tools, I’ve created a solution that is centered on the least number of exercises that you need to do, in the right order and the correct amount that cover all of the areas that need to be addressed to relieve SI Joint Pain. You see, the problem with doing a lot of different exercises in a scattershot approach is that often, key components of a sacroiliac joint dysfunction recovery program can be missed. Doing the exercises in the right order will increase their effectiveness. The right exercises done in the right sequence can build on each other and produce greater and faster results. To be honest, I would stop all of the other exercises you are doing for your lower back pain and give this program a go for 7 days. That short period of time is enough for you to see the difference a well-thought out plan like this can make for your sacroiliac joint pain. You’ll notice the difference physically almost right away. 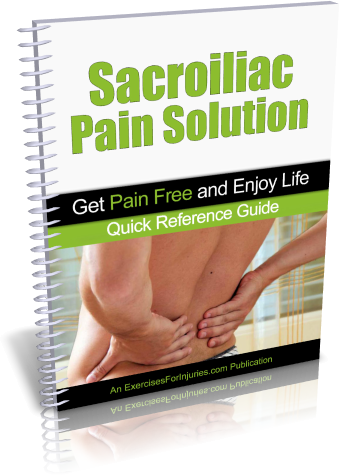 At last, there is a comprehensive, yet simple-to-follow program that contains the exercises you need to know to naturally eliminate your sacroiliac joint pain. Plus, as I mentioned before, this program contains an assessment guide so that you can determine if you have sacroiliac joint dysfunction and the severity of your injury. You get a video, manual and fill-in sheet to help you assess your current condition. The video and manual walk you through how to assess the current condition of your sacroiliac joint. This is important to do because different people experience different levels of pain and stiffness. You’ll record your assessments on the fill-in sheet and based on your findings, you’ll know exactly where to start in the Sacroiliac (SI) Joint Pain Solution Program. This assessment process is critical to ensuring you get the best results possible from the program and you avoid injury. The Sacroiliac (SI) Joint Pain Solution is filled with a lot of beneficial information but I want you to be able to get started and experience results as fast as possible, so I created this guide which distills all the content down to the bare essentials you need to know to get started fast. Give you everything you need – exactly how many reps and sets you should do, time and intensity, what you should feel as you do the exercises so you know you’re doing them right... and more. Get The Sacroiliac (SI) Joint Pain Solution Today! 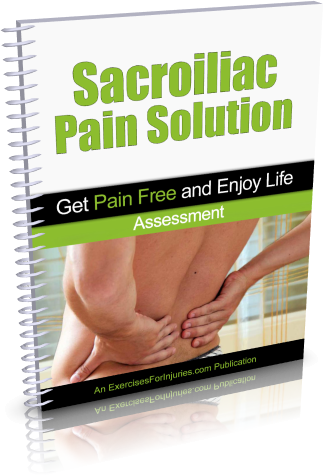 The Sacroiliac (SI) Joint Pain Solution is filled with the expert tips and exercises that will allow you to eliminate your discomfort and pain as fast as possible. Save yourself money and frustration – get The Sacroiliac (SI) Joint Pain Solution today and regain pain-free mobility! Remember, use of acetaminophen can eventually cause nausea, vomiting, loss of appetite, or severe stomach pain, trouble passing urine or change in the amount of urine, light-headedness, sweating, fainting, or weakness, unusual bruising or bleeding, and yellowing of the skin or whites of your eyes. Likewise, using non-steroidal anti-inflammatory drugs (NSAIDS) can cause swelling of the arms and legs, ulcers, bleeding, kidney failure and liver failure. Our program is a safe, natural solution with no bad side effects. Heal your back safely and naturally with the very best exercises that have ever been created. Get The Sacroiliac (SI) Joint Pain Solution today! For just $37 you could save hundreds and possibly thousands in medical costs and you’ll avoid the bad effects associated with both over-the-counter and prescription medications. I am so sure that you will love The Sacroiliac (SI) Joint Pain Solution that I am offering an unconditional 100% money-back guarantee. Get on the Fast Track to Being Pain Free! CLICK HERE NOW to order the The Sacroiliac (SI) Joint Pain Solution program for just $37!